In the week leading up to Easter a bunch of church and community leaders in my area of Brisbane city came together to create “an artistic community-minded Easter display” at a popular local shopping centre. 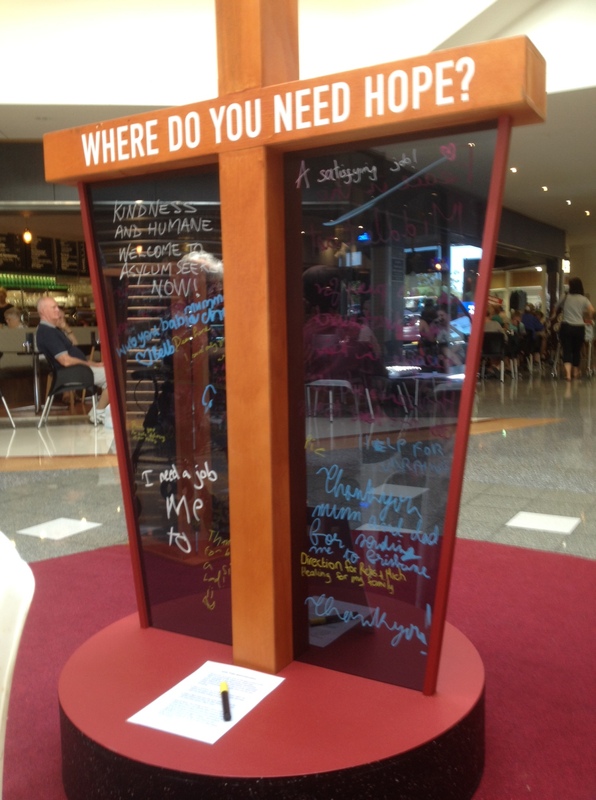 We decided to set up a cross with an inscribed question along the horizontal axis “Where do you need hope?”, arrange prayer board stations for people to write down a public response, and created a flyer listing Easter church service times which included a few words on “why Easter offers hope”. On the Monday morning before Easter Sunday, the door to Kenmore Village opened along with our Easter display. Within a few minutes a local coffee shop encouraged us with muffins and hot drinks as a token of support. As we expressed our gratitude, we were surprised to look back and find people already curiously approaching the cross to write down their “hopes”. Some wrote personal things such as, “reconciliation with my parents”, “health issues” or “I want to feel accepted”. Others offered global hopes: “Peace in Syria and Eastern Europe” or “food for the hungry”. Regardless of personal beliefs, many people throughout the week wrote about a place they needed hope, countless others paused as they identified with what they were reading. Some stood before the cross wondering about the significance of Easter within these spaces of needed hope. We decided to invite people to come join us to pray for these “hopes” at an Easter sunrise service, and talk about why Christian’s talk about hope so much at Easter. By the end of the week, all 10 of our prayer boards had been filled and many engaging conversations were enjoyed. The Easter display had become a fantastic space where the voice our community of needs encountered the cross with message of hope. Finally, in the dark hours of Easter morning our entire Easter display was transported to the top of Mount Cootha for our early gathering. It seemed fitting our display had both a fantastic view of the city and sunrise. Roughly 300 folks gathered in the chilly darkness to watch the sun rise, a few old songs were sung in anticipation. It was a fantastic moment as the sun finally broke over the darkness of the city and the warm light spilled over the wooden cross and prayer board “hopes”. We recalled how one follower of Jesus named Mary had once hopelessly travelled through the early morning darkness to Jesus’s tomb Easter morning. With the dawn came new hope, Jesus had risen. Soon, many others had heard rumours of a resurrection, many wondered if it could be true. And if so, what did it mean? Eye witness accounts by reliable sources and crowds of people also found what Mary found, that these rumours of new life were true! 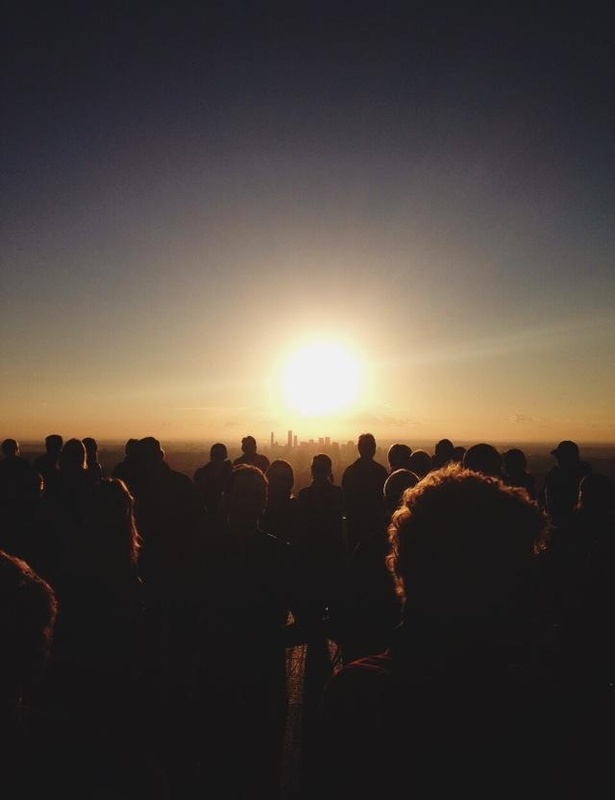 So even today, at Mount Cootha, we began to pray for the needs of our city with a real hope. 2000 years later, God is still at work bringing new life into the darkest places of need. Easter reminds us of this. The Easter story invites us into the life giving agenda of God…we join in as we become peacemakers, welcome the stranger, care for the poor, pray for the needs of our community, and allow Jesus to make us fully human, fully alive. Because of Easter, we can live with a hope which starts bringing real life even today.